BetOnline has a promo upcoming on Jun 10 (Tweet for your Seat). They had the same promo on May 5th. I followed all the instructions for the May 5th tourney, but was never registered or emailed or tweeted any registration options. 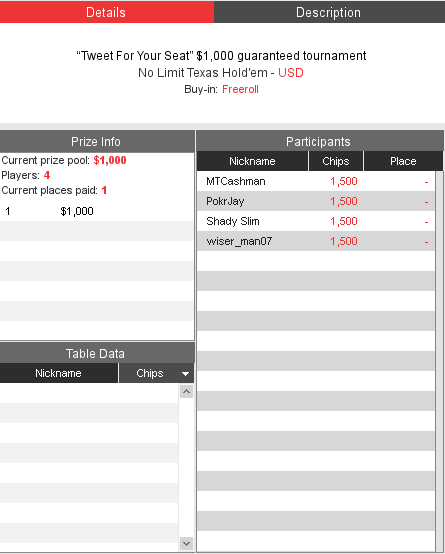 A CC member, John_3_14, was in that freeroll and took 4th place. If he doesn't see this thread, you can probably PM him with that question. You can find him by searching the Members List (https://www.cardschat.com/memberlist.php). Contacting BOL will probably not do any good. They are not responsible for the rules and questions for that particular tournament. I would suggest Direct Messaging them on Twitter and see if they will respond. Looking? Have you tried to Direct Message them on Twitter yet? Got to follow them on twitter and make a tweet before the last day of month to get in. You will be automatically registered the next tourney on June 10. Note there is a direct link on that page to tweet all you got to do is hit it and replace "x" with your username. If you have any problems contact them via twitter. I won it in May) But I've registered for april. Thats a real maze for registration in this tourney. Thanks everyone; I am trying again to get in the Jun 10th one. Maybe I didn't do my tweet in time for the last one. Hope to see you there next month! I also could not find the information, if anyone has, share, I will be happy! I think the deadline for sign up is today. Did anyone find out anymore information about how to register for the tournament? I followed the instructions to the letter. It was on time too. Noticed the tournament is scheduled for tomorrow and open for registration. There are no registrations so far. Has anybody received a ticket for this event yet? Hmmmm. Still no ticket and nobody else has registered yet either. Same here. I tweeted twice before the deadline just to make sure but still nothing. I could be wrong but I don't think we get a ticket. I think everyone who tweets as per instructions gets registered by Betonline. Keep your eyes peeled. I remember in April I tweeted before the deadline but wasn't registered. Had to contact live chat to get me registered before the start of the freeroll. Easy enough for the person in charge of keeping track of tweets to accidentally miss a few. They ask what date you tweeted and confirm it so make sure you know. Thanks for the heads up! Just a little bit of work to get into this, but hey, for $1000 GTD it is worth it. Currently, there is 8 hours and 10 minutes and counting. I am wondering if that auto-registration that XYZ referred to might not happen until about an hour before the tournament starts. Maybe even a half hour. Currently, there is 6 hours until start time. There is one person registered "wiser_man07" and paying down one spot for $1000! Shady Slim, I see you got yourself registered. There are now 4 people. Did you get a ticket or contact customer support? Update. I am entered into the tournament. I went the route that XYZ2123 went and asked via Live Chat. After verifying my tweet with the operator (Oscar), I was automatically registered into the tournament. Asked Oscar if this was automated. He said, yes, that players are added in lots. I said, they are being added in a slow trickle. He said, it is a big tournament and I fast-tracked you. I thought that was nice. I posted while you posted. See above. While I did get a ticket, I may have been auto-registered according to the Support guy. If you don't see your name up there soon, I would go the same route. You will notice that MTCashman is on that list. We could probably ask him the same question. When did the registration end?? it says Registering but the link https://t.co/0RTp9k8Of5 says the registration ended...so does that make it final? i gave it a shot for the heck of it lol...... only 4 people going for the Grand! WOW!!! goodluck guys ! If you registered before midnight on May 31st, then you are in the queue. If you read my last few posts, I go into a little detail on how this works and how you can assure yourself a seat. There is still about 4-1/2 hours until registration closes and the game starts. Monitor the tournament lobby and if it gets to within an hour before start and you are not on the list, Live Chat them quick. If too many people use Live Chat minutes before start, you will not make it. Just saying. You have to follow BOL on Twitter and tweet your BOL poker name (in reply to their promo tweet about the freeroll). The deadline is the last day of the previous month, in this case May 31st. Shady is thinking to himself Then again, it would be kind of sweet if just four of us were playing for that $1000. We're all thinking the same thing but last month there were around 80 runners so I expect roughly the same this time. About 30 min since my Live Chat with CS and still not registered. They said I should receive a ticket "shortly" whatever that means. I just want to make sure its done and not have to worry about it last minute. How long did it take for you, Slim? Before I ended the chat session, I was registered. So, I guess in seconds. No ticket, I was just registered. I registered yesterday, am I eligible for the ticket? The floodgates have opened and the tournament is filling up with people. So far there are 134 entrants. No. Deadline is the last day of the previous month. You should be in the next one. Still do not see you on the list! BasilK, right? Maybe the next batch? Cool beans. See you in that one! It is kind of amazing that there are not that many entrants. So far only 134. Even if this goes over 200, that is not very many for a prize pool of this size. Heck, you get around 500+ playing in those ACR $10 On Demands. Just as an FYI, I received two emails from BOL. You have won a ticket to tournament “Tweet For Your Seat” $1,000 guaranteed tournament (starts at June 10, 2018 11:30:00 PM UTC) and have automatically been registered in it. See tournament “Tweet For Your Seat” $1,000 guaranteed tournament lobby for details. Congratulations!You have completed your bonus! First came in 2 hours ago and second was 54 minutes ago. This is a monthly tourney right? is it always going to be on the seond sunday? guess ill be in the next one as I just tweeted at them and direct messaged them moments ago. I got an email at 15.58 ET saying I am registered. This should be the final field size as the process is automated, 134 runners. Best of luck to all who are participating! I got an email at 15.58 ET saying I am registered. This should be the final field size as the process is automated, 134 runners. ! <UGH> I followed BOL on twitter and tweeted for my seat the first week of June and for whatever reason, I was not registered. Good luck to everyone that is playing! If you followed my instructions earlier in thread you should have gotten in. If you followed instructions and did not get in talk to BOL live chat or send message to BOL on twitter. Send them a screen shot or link of the tweet. OK, so now, after almost two hours of going back and forth with Betonline customer service about why I wasn't registered for the Twitter Freeroll today, I finally got a specific explanation. Apparently, players have to send their tweet to register for the freeroll literally ON the last day of the previous month, not before, not after. In other words, tweets should have been dated before midnight ON May 31st to qualify for the June freeroll, and since my Tweet was dated May 20th, I didn't follow the rules and so was not eligible. 4. Once the specified 'Follow' and 'Tweet' actions are completed (BEFORE midnight on the last day of the month proceeding the freeroll) - players will then be eligible to register for the "Monthly Twitter Freeroll" when it appears in the poker lobby on the first Sunday of each month." In past months, it was my understanding that you just had to tweet before the end of the previous month, not ON the last day. This worked for me in the past and I wasn't aware that it had changed. So did others actually tweet ON the last day of the previous month (May 31st) or earlier? Feedback is appreciated so we can all do it correctly in the future. Plus I want to know if BOL is full of baloney and/or I've completely lost my mind. Based on what you've all said earlier in this thread I have a feeling I just got shafted. Anyway GLGL to all who do get to play. I tweeted on May 24th. Oscar asked me to send him a link to that Tweet, which I did, and I was registered. Thanks to everyone who shared their experiences with this tourney; it is always nice to know you are not alone! What day did you make your Tweet? Was it on May 31st exactly, or another day in May? Oh, and I did not send my tweet(s) on 05/31/2018 either. I tweeted 2x during the month of May, but neither tweet was on the last day. Agreed, I think he got screwed on that. UPDATE: I initiated a live chat with BOL agent. He requested that I take a screenshot of my tweet and send an email with screenshots to poker@betonline.ag. Within minutes BetOnline was able to confirm that I indeed tweeted on May 23 (and again on May 28). I was then sent registration. This was my first interaction with BetOnline support team. During the chat, Lee (BetOnline rep) was amazing. His questions and instructions were very clear. Exactly. It was never an issue before. I don't think that what this BOL Rep said about the date is true. He didn't know what was wrong either and was doing his best to get rid of me. Maybe there was some glitch with my account and they just couldn't do it. The only other thing I can think of (though this is not the explanation they gave) is that I didn't use their template for wording the tweet the way you did here, which is also new to me. In the past, again unless I'm mistaken, all you had to do was reply to BOL's Tweet about the freeroll with your BOL poker name before the end of the month. You didn't have to CREATE a tweet with this wording. From now on I'll make sure I revisit the promo page and re-read the T&C before I tweet every month. It does say they can change T&C anytime, so can't just assume its the same as the previous month. Last month, despite the T&C, they let people register until first week of May, and now there's this template for the tweet. I still don't trust customer service after my experience today, but ultimately perhaps its just my fault for not paying close enough attention. I think your rep misread it. Sorry about that. Since I last posted, there are 4 more people added to the tournament. It is set at 138 and about to start. Yeah I see that. Anyway, hope I can join in next time. Good luck, man! !